Warren Buffett's Junk-Food Diet Has Gotten Him to 88: Should You Follow It? The Oracle of Omaha might eat some Dairy Queen and See's Chocolate on his birthday. Should you follow his diet advice along with his investment tips? Warren Buffett celebrates this his 88th birthday on Aug. 30, with help from (or in spite of) McDonald's (MCD - Get Report) , Utz, See's Chocolates, Dairy Queen and Coca-Cola (KO - Get Report) . The Oracle of Omaha has an estimated net worth of more than $86 billion, ranking him among the top five richest men in the world. Yet, the Berkshire Hathaway (BRK.A - Get Report) (BRK.B - Get Report) CEO's private life has been defined more by comfort than conspicuous spending. He still lives in the same home he bought in 1958 for $31,500. "My life couldn't be happier," Buffett said a Berkshire Hathaway shareholder's meeting in 2014. "In fact, it'd be worse if I had six or eight houses. So, I have everything I need to have, and I don't need any more." This isn't a habit he restricts to breakfast, either. When he took Microsoft founder Bill Gates to lunch a few years ago, he decided on McDonald's as the venue. The result made it into Bill and Melinda Gates' 2017 annual letter. "Remember the laugh we had when we traveled together to Hong Kong and decided to get lunch at McDonald's?" Bill wrote. "You offered to pay, dug into your pocket, and pulled out … coupons!" But Buffett's diet doesn't make him cheap. In fact, it's cost him quite a bit of money in the past. Buffett bought See's Candies for $25 million in 1972 not just because he saw potential in it, but because he loved its nut fudge and peanut brittle. Buffett bought Dairy Queen for $585 million in 1997 not just for its low overhead and growth potential, but because he enjoys it himself. "What I usually get is a sundae," Buffett told Yahoo Finance. "I get the small sundae for the ice cream and the extra large sundae for the topping. So I mean, I just smother in the cherry topping and then pour a lot of nuts on it." In fact, if you go to Omaha, you can visit Buffett's McDonald's, Dairy Queen and favorite steakhouse, Gorat's, and eat like a billionaire for less than $50. But should you? 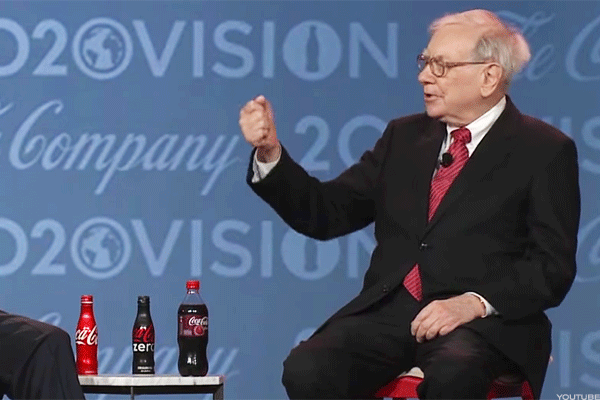 Last year, through journalist Andrew Ross Sorkin, a Berkshire Hathaway investor questioned Buffett's investment in Coca-Cola, saying it contributes to roughly 137,000 deaths a year from diabetes, 45,000 deaths from heart disease, and a few more thousand a year from cancer. A year earlier, Bill Ackman said Buffett's investment in Coca-Cola was immoral. Buffett's answer? "There's no evidence that I will any better reach 100 if I had lived on broccoli and water," he said. That doesn't necessarily mean that eating 2,700 calories of fast food, soda and snacks will get you to 87 years old. Jessica Weneger, a registered dietitian in Buffett's hometown of Omaha, notes that it's difficult to hand out blanket nutrition recommendations without knowing Buffett's other eating habits, his medical diagnosis and what his current exercise plan looks like. Based on Buffett's own estimate of 2,700 calories per day, Wegener says that there is always a concern that it could lead to weight issues and obesity, which in turn can lead to chronic disease. She also says that high caloric content could also simply be a byproduct of unconscious overeating. "I believe that no one can follow a diet of food that they don't like," Wegener says. "I would suggest decreasing total intake of higher calorie and saturated fat foods by eating smaller portions of his current favorites and add more fruits and vegetables to go alongside to balance out his less nutritious food choices. I would also discuss how he feels to find out if his diet could be effecting his overall health and wellness." Buffett has made attempts to explain his high-sugar, high-salt diet in the past. In 2015, for example, he told Fortune, "I checked the actuarial tables, and the lowest death rate is among six-year-olds. So I decided to eat like a six-year-old. It's the safest course I can take." However, when a writer from Fusion attempted to eat like Buffett -- including his dinner favorite of chicken-fried steak with mashed potatoes and a strawberry malt -- she was sickened after one day. Omaha dietitian Wegener notes that dietary habits vary widely by individuals and that what works for Buffett, or even those who follow the kale trail and turn green just looking at what he eats in a day, won't necessarily work for others. "For those people who use the excuse that Warren Buffett does it, I would encourage them to assess their current health, how they feel, their relationship with food and to not compare themselves to anyone, as no one has the same genetic make up that they do, unless they have an identical twin," Wegener says. "Each person needs to follow the plan or type of eating style that works best for them."